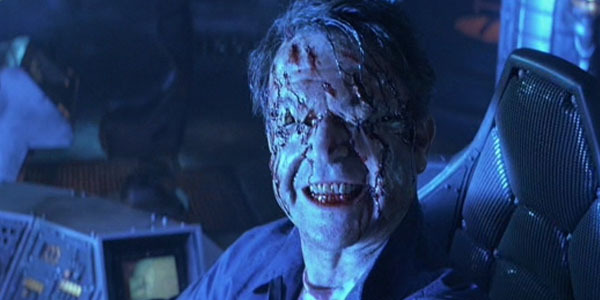 Of course Nolan wouldn't reference Event Horizon... would he?! Somewhat inevitably, Christopher Nolan's latest film is a divisive one: just as The Dark Knight Rises polarised responses from audiences, the sprawling, spectacular Interstellar will inspire wildly different reactions from viewers. It is a spectacle to be reckoned with, a tone poem like so many of its very obvious influencers, and it is a love letter to the aesthetic of cinema as much as it is a sci-fi about humanity's last ditch attempt to save itself. It might not be for everyone, but it has some truly stunning moments. Nolan's pure sci-fi isn't exactly subtle, there are some terribly cheesy lines, and the final third of it is a bit... odd, but it's a sci-fi in the purest terms (perhaps with more emphasis on the fi, rather than the sic at times, despite the presence of expert advisors). But as you would expect it is a film-maker's film, for cinephiles and lovers of the processes and legacy of film, and as such, it's packed with references and Easter Eggs, the best of which follow here. Some - like the Event Horizon link - might be more surprising than others. Inevitably, spoilers will follow.